Ghanaian funeral parade with female dancer. “Really? Why only on those days?” I asked. “For funerals; in Ghana we fancy funerals,” Kofi said nonchalantly. And from what I’d observed after my relocation to Ghana, Kofi was right. Ghanaians took the matter of the dead to a particular level that I’d seen nowhere else, not even during my childhood in St. Lucia when fastidious attention was given to the deceased. It was a Wednesday. Kofi, my nephew-in-law, was accompanying me into town to do errands. I was wearing a white African skirt and top set trimmed with beige. There was no particular reason for deciding to wear the outfit besides the fact that it was the easiest to iron among all the crumpled ones in my suitcases and barrels. But Kofi’s comment on my choice of dressing on a Wednesday had suddenly made me pay attention to Ghanaians’ reaction to their dead. For almost all my life I avoided anything to do with the dead. I never attended a funeral; neither my beloved father’s nor my favourite brother’s. I found the typically black-attire affair with solemn singing and hush-hush crying more depressing than the dead body lying in the coffin. That changed after I attended my first funeral in Ghana in 2007. Since then I’m yet to turn down an invitation to participate in ‘mourning’ a Ghanaian. In general, continental Africans revere their deceased. Gerald Massey, the unbiased British Egyptologist, credits this fact to the undeniable connection of Ancient Egypt with the rest of Afrika. Nowhere is the reverence for the dead more evident than the phenomenal royal burial sites of Egypt—the Pyramids. 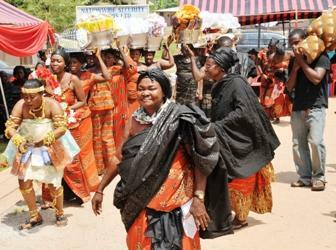 And Ghanaians are no exception to this fundamental tradition—speciality coffins can attest to this. Furthermore, one simply has to pass near a morgue on a Friday afternoon to get an introduction to the funeral culture. Among the Ewes and Asantes the celebration of the deceased’s life begins at about 5:30 a.m. on the day following death. It ends only after the body has been entombed, which could take months to happen as will later be discussed. For the duration of this celebration mourners intermittently arrive at the deceased’s family home to share condolences. During this period the mourning the family also organize themselves into a ‘funeral committee.’ This committee is to oversee the successful hosting of all things related to the wake, burial and funeral celebration. The funeral committee will include a designated member specifically for making the daily visit to the morgue to ensure the body will be easily located upon retrieval time. More importantly, this person will be the family’s eyewitness that their loved one’s body is as intact as when she arrived at the morgue. Bodies have not only been difficult to locate when left at the morgue but body parts have also simply vanished. The latter is all Ghanaian family’s dreaded nightmare. Not a month goes by in Ghana without a news report of a murder for suspected ritual purposes. Unscrupulous morgue workers believe the selling of body parts taken off an already dead person is a economical means to accommodate the supply-and-demand needs of the sinister ritual business. While sympathizers do their coming and going the Funeral Committee goes into full gear. The family house where mourners will congregate for the wake and often for the funeral celebration must be painted. If the anticipated number of mourners for funeral celebration is excessive a field, school ground, or a stretch of road has to be secured; the sound system with DJ and PA system along with an MC will be hired, chairs and canopies and live non-traditional along with traditional musicians are sought. The committee will also select and order from a textile manufacturer the specially designed cloth with tailored wordings. The immediate members of the deceased’s family will wear outfits made from this special cloth to the burial and funeral celebration. Souvenirs are ordered to give during the funeral celebration such as, a calendar with pictures of the deceased, key chain and handkerchiefs with an emblem of the dead. Liquor and beverage need to be purchased, hiring of priest/pastor for prayers during the viewing of the body; renting of church and priest/pastor for Sunday Thanksgiving Service; hiring of professional photographer and videographer and of course, shopping for the meal that will be cooked for the funeral celebration and finding volunteers to cook are all part of the duties of the Committee.